Ekwow Spio-Garbrah, a first vice chairman of the National Democratic Congress (NDC), is angry with his party members following a statement issued by their national chairman. 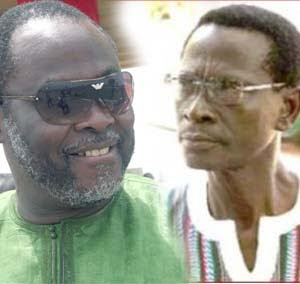 Dr. Kwabena Adjei is accusing Dr. Spio-Garbrah of abandoning a task given him to resolve former President Jerry John Rawlings’s accommodation problem. Spio described portions of the chairman’s statement as “a sophisticated hoax”, as the section quoted was “totally false”. Spio had castigated President John Evans Atta Mills for leaving ex-President Rawlings homeless, when he honoured an invitation to speak at a Tertiary Education Institution Network (TEIN) workshop in Accra on November 9, 2010. This incurred the wrath of the NDC leadership, which expressed what some political analysts believed was a belated concern about the housing issue. The statement condemning Dr. Spio-Garbrah, Dela Coffie, Communications Director of Friends of Nana Konadu Agyemang Rawlings (FONKAR) as well as the TEIN members, was signed by NDC national chairman, Dr. Kwabena Adjei whose ‘there are many ways of killing a cat’ statement, with reference to judges in the country, caused fear and panic among judges recently. Reacting to the ‘falsehood’ put out by the NDC chairman, Dr. Spio-Garbrah said, “My attention has been drawn to a statement issued yesterday, purportedly under the signature of Dr Kwabena Adjei, the chairman of our party, the National Democratic Congress (NDC)…I hope that this statement allegedly put out by the party chairman is a sophisticated hoax, as the section quoted above is totally false. He noted that following the discussion of the subject, he was part of a large party delegation which met urgently at the Castle to discuss the issue with President Mills and other senior Castle officials, saying, “So, yes, I have been concerned with this matter, as one of several factors which in my opinion is detracting from party unity, and I have tried to use all internal party channels to have it addressed. “In fact, it would have been awkward and inappropriate for the only vice chairman of the party who is known to reside outside Ghana to have been appointed as chairman of a committee that needed to urgently address such an important matter of state which affects the party, when there are four or five other vice chairmen who could have handled this matter. Dr. Spio-Garbrah said the whole spectacle and the blame-game over the Rawlings house issue was a shame, noting that there was not a single person at the Castle, the seat of government, who was not benefiting from the sacrifices made by former President Rawlings. He said he had never denigrated President Mills “for this situation or any other matter”, even though he bore part of this collective responsibility and asked NDC members who could not maintain joint respect for both President Mills and ex-President Rawlings to explain their positions to the public, and not drag him into their problems. He had told TEIN members at the workshop in Accra that the NDC government had not shown gratitude to Rawlings for all his sacrifices. “I understand that President Rawlings cannot award contracts today and that is because he doesn’t make appointments anymore. He is not relevant and of no value to the party. Otherwise it is not possible that even when disaster victims faraway in Haiti can receive a donation of $3million but when a disaster befalls the founder of the party and former President of the Republic of Ghana who by the Constitution is required to be given official accommodation, till today he does not have official accommodation. And yet there are over one thousand Government bungalows in Accra and I personally have identified some of them and have recommended it to the people concerned.